Your students will use the information provided to answer questions about the volume, mass, and capacity of the human body. This is a great way to teach students how to use science skills to connect to real life concepts. 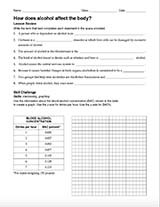 This activity is perfect for grade 5 students. What Happens to Air Before It Reaches the Lungs?